On my first trip along the ring road in Iceland, I decided to try my hand at waterfall photography utilizing an ND filter. This is Gufufoss on the eastern side of the island. Very nice! What shutter speed did you end up with? It would be interesting to see it at somewhat faster speeds as well. Did you use a polarizer as well? The shutter speed is 15 seconds, and I did not use a polarizer. The ND filter is a 10 stop B+W and I was shooting with a Canon 7D mk II with a Sigma 18-35mm f/1.8 DC HSM Art Lens. I normally focus on wildlife photography, but the scenery in Iceland was simply too incredible not to shoot it. That is a great fall. Thanks for sharing. I hope you have more to post. Thanks. It was my favourite waterfall of the trip, and quite an adventure to get there. That is a very nice collection of shots. You are only moving Iceland up my list (been toying with a trip as soon as next year, but we'll see). You posted the photo under "image critique".....so, I thought I would take a stab at it. Mind the fact that I agree with the others, it is a very good shot and so much of this is personal preference/monitor calibration/etc. The level is a bit off to my eye. This can make certain ribbons of water seem like they are falling unnaturally. I'd say only a degree or so (adjusted 1.5 degrees below, which may be too much). As for composition, I wonder what the image would have been like a few steps to your left and lower. Have the river lead you to the water fall (Top center placement of waterfalls is tough). Timing is a matter of choice, and here there are massive trade offs. I really like the 15 secs on the river, for the falls, I wonder what less time would looked like. Sometimes (certainly not always) when looking at a falls, I try to time the water as it falls and match that in my exposure. That way the final image is a single "arc" of water falling and not multiple which can impede the definition of the falls. Greens, shadows, and sharpening seem a bit intense to me. So, of course, I took a stab at implementing these changes. Last edited by Kayaker72; 09-05-2016 at 11:26 AM. Thanks so much for the feedback. I'm going to play around with your suggestions and let you know how it turns out. I haven't had the chance to get a proper display and have it calibrated, so I've always know that my colours and lighting will be off to some degree. Did you use ISO 50 to achieve a slower shutter speed? On most cameras shooting below ISO 100 decreases the dynamic range. Some shadow areas seem black. Anyway, congrats. I hope to visit Iceland one day too. 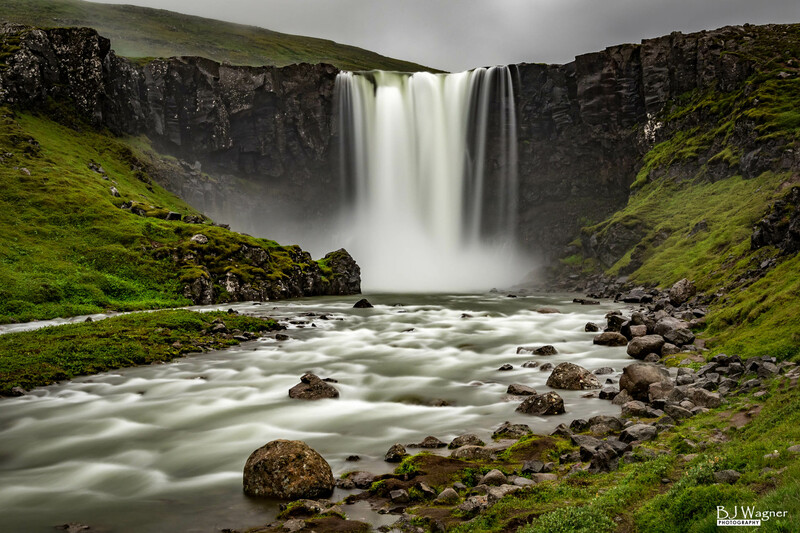 JB thanks for sharing - Iceland in on the bucket list, just got moved up after looking at your pics. With all the green around, there would be huge amount of green reflection in the ambient light.